Not every lab has the cash to shell out on fancy equipment. And let’s face it, in today’s climate of budget cuts, even the baller labs are looking for ways to be more frugal. Years of lab work has taught me a thing or two on how to make ends meet. So, if you’ve found your way here because you’re looking for ways to save in the lab, you’re in the right place! Maybe you’re just looking for ways to get experiments done when you don’t have the “proper” equipment? Here, I share some trusty lab hacks, and welcome you to share your own with us. When running a western blot, a large amount of waste (of water and of resources) can be avoided by reusing both running and transfer buffers. A first-time, over-cautious person might make new buffers every time, but there’s no need to. This author suggests that re-using buffers up to 5 times is perfectly okay. (https://www.ncbi.nlm.nih.gov/pmc/articles/PMC2685604/). Of course, use your own discretion. If you observe cloudiness, or a strange smell, it’s likely time to discard it. Reusing the transfer buffer is also eco-friendly, as less methanol-containing waste is generated. 2. Substitute pricey items for cheaper alternatives. First, continuing with the theme of buffers, it is easy to find commercial Tris buffer for western blots, but it is just as effective, and way cheaper, to use borate buffer instead. 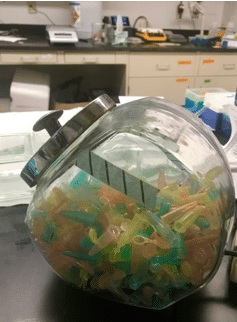 Use glass cookie jars to store your autoclaved Eppendorf tubes. In a big lab with multiple benches, each bench usually has its own tube jar/holder. You can save a bit of money by using cheap glass cookie jars. The angled opening is also very accessible. 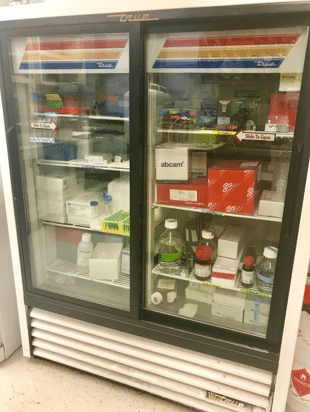 Use a sliding glass door fridge to store boxed reagents and reagents that are not light-sensitive. For example, in our lab, instead of buying a pricey chromatography fridge, we got a convenience store cooler that cools to -4oC, and it works just as well for less. 3. Recycle Styrofoam boxes from packages as ice buckets. Why would you ever need to buy a new icebox when you have new iceboxes coming into the lab every day? 4. Reuse your pipette tip boxes. Is my lab the only place where pipette tip boxes are the unofficial gold standard for weighing mice? After running out of weigh boats during a big study, I quickly realized that an empty pipette box, sitting unassumingly on a lab bench, is a great substitute for a small-animal weigh boat, and have been using them ever since. Another use for pipette boxes is as racks for small tubes. Either as holders for PCR tubes during experiments or as fridge/freezer containers. I keep my cDNA in compact pipette boxes to save space in the freezer and avoid buying more containers. 5. Bring your kitchen to the lab. Need to boil protein samples during a western? Use a deep fryer for easy dunking and retrieval. Another kitchen staple is the pressure cooker, which can be used for antigen retrieval. 6. Vacuum traps are often used in tissue culture hoods to aspirate biohazardous waste. While you can buy these, it’s much cheaper to use leftovers from hospital surgeries. Physicians are required to discard opened vacuum traps, even if they are unused. The Oliver Twist in me is then waiting, bowl out, to take them off their hands. 7. Need a new cabinet? Desk? Chair? Most institutions are full of surplus and waste. Roam the hallways first to check if someone isn’t getting rid of what you’re looking for. Not all lab hacks are quirky and strange: banned in some places is the cooling of lunch and celebratory drinks in the ice bin. These tips can come in very handy when you’re in a pinch. Now, let’s hear some of the money and time-saving things you do in the lab. Even better: 4. 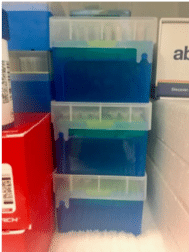 REFILL your pipette tip boxes! I hate throwing away all those tips, but there’s just no meaningful way to reuse or recycle them. But we sure don’t have to throw away, or even recycle, the boxes! Buying tips in bulk, racking them and autoclaving is still by far the most economical and sustainable route. Plus, racking a couple dozen boxes is a great stress reducer when things ain’t goin’ so well in the lab.